Brian Jungen took the traditional mask what would have been carved out of a wood like red cedar and used something that is now so pervasive in pop culture. It appears that he deconstructed the White Jordan XIII’s. Which is fitting because the colors Black Red and White are key in many NorthWest coast native american cultures. 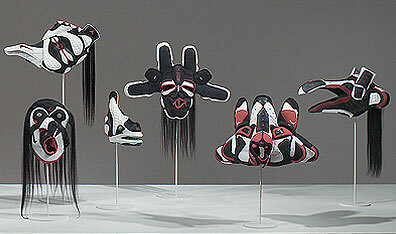 To use shoes is not a medium I would have thought could have been used to evoke the feeling of the masks created by people of the first nations. This is an exibit I would like to see in person. ← Can Cyhi Bring the heat?